The notion that Mars once hosted an ancient, watery ocean is intellectually seductive. Not only does it make the Red Planet seem much more like our own, it raises hopes for finding evidence of hypothetical life that once swam the Martian seas. In 2016, scientists announced that they had uncovered evidence that two mega-tsunamis once blasted across the Martian surface, likely sparked by asteroid impacts. 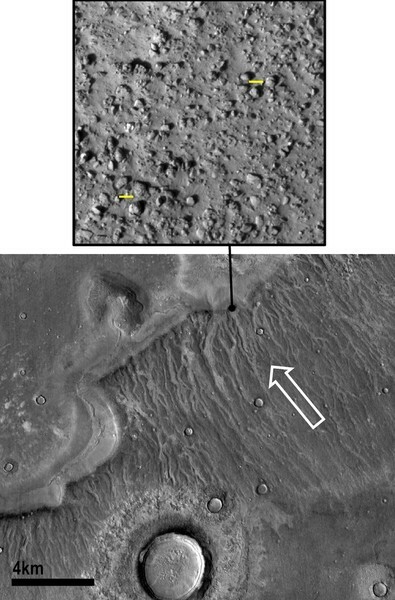 Images taken with NASA's Mars Odyssey, the Mars Reconnaissance Orbiter (MRO), and the Mars Global Surveyor seemed to show boulder and sediment deposits from tsunamis that overran and buried ancient shorelines. Researchers Martin Turbet and François Forget at the French National Center for Scientific Research were intrigued by these findings but simultaneously skeptical. In a new paper published to Scientific Reports, they detail a key paradox challenging the existence of an ancient Martian ocean and any accompanying tsunamis. "If cold, the ocean should have been entirely frozen shortly after its formation, thus preventing the formation of tsunami events. If warm, the ice-free ocean should have produced fluvial erosion of Hesperian Mars terrains much more extensively than previously reported," they write. Bottom line, based on current observations of Mars and what we know about the planet's past climate, an ancient liquid ocean could not have existed on Mars for long, Turbet and Forget say. A 200-meter-deep ocean likely would have frozen solid in just 4,000 years. Even if there was a brief period during Mars' Late Hesperian period, between two and three billion years ago, where the planet warmed enough for an ocean not to rapidly freeze, the planet's thin atmosphere would have caused the waters to swiftly evaporate. But what of the tsunami observations? It's possibly, though unlikely, that repeat meteorite impacts could have produced the giant waves. "The first impact would deglaciate the ocean, and the following impacts could then produce the tsunami," Turbet and Forget write. It's also possible that the tsunamis didn't happen at all because a perennial ocean never existed. Instead, the deposits spotted back in 2016 may have resulted from groundwater outflows spawned by abrupt geological changes. Despite the fact that six human-made satellites orbit Mars and two active landers dwell upon it, the Red Planet remains a mystery. It may not give up its most coveted secrets until human explorers have a more intimate look.